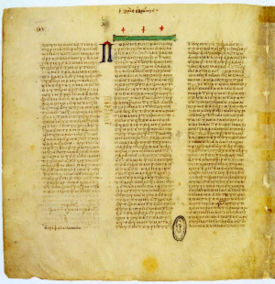 The Septuagint is the most ancient translation of the Old Testament and consequently is invaluable to critics for understanding and correcting the Hebrew text (Massorah), the latter, such as it has come down to us, being the text established by the Massoretes in the sixth century A.D. Many textual corruptions, additions, omissions, or transpositions must have crept into the Hebrew text between the third and second centuries B.C. and the sixth and seventh centuries of our era; the manuscripts therefore which the Seventy had at their disposal, may in places have been better than the Massoretic manuscripts. Jesus and the apostles quoted extensively from the Septuagint, which verifies the validity of the translation. The Oldest Text Of The Old Testament In The Translation Of Charles Thomson Secretary of The Continental Congress Of The United States of America, 1774-1789 As Edited, Revised, and Enlarged. Charles Thomson was a Founding Father of our nation, served as Secretary of the Continental Congress. He devoted most of his life to the translation of the Septuagint. Horne says (1846): "Very few copies of Mr. Thomson's work have reached England, and even in America it has become very scarce and dear." * "Introduction to the Critical Study and Knowledge of the Holy Scriptures," vol. ii. pp. 282-333; vol. v. p. 303 (1846). † "Introduction to the New Testament," vol. i. pt. i. chap. iv. sec. iii. ‡ Dr. Clarke's "Commentary," vol. i. General Preface, p. xv. Amazing Studies of the Bible A mega-site of the Bible, Christian and religious information and studies; including, audio and written KJV Bible, churches, doctrine, links, news, prayer, prophecy, sermons, spiritual warfare, statistics & tracts. Features Chronological 4 Gospels, Prayer Book, Prophecy Bible, and a photo tour of Israel. By God's mercy, one of the largest Bible-centered sites on the web (app. 6000 pgs). If it's in the Bible, it should be on this site. www.amazingbible.org.